I designed and built an interface that allows me to switch the interface between 2 radios. It also has some other features such as dual mic input and footswitch PTT. It senses PTT output from the interface PC input and switches off the main external mic input (I use an external mic and mixer into the ACC2 port) allowing auto switching from the external mic to the PC audio output. A simple interface may be used for audio in/out via audio isolation transformers and PC comport RTS or DTR detection via an optocoupler. I am using Windows 10 Pro with a quad core processor. There are 4 connections. The RS-232 from the TS2000 to the PC serial port (uses com 1). The PC soundcard audio out to the interface audio in. The soundcard audio in from the interface audio out. PTT control from a second PC serial port (uses com 2) to the interface PTT sensing control. My PC has 1 built in 9 pin comport. I purchased a PCI card comport and installed this into a riser slot. The system needs 2 comports to work. There are 2 pieces of software required for Pocket RxTx. The PC requires jAReC ver 9, see website above (the PC must have Java installed for jAReC to work). It is a small program that is used to control the radio via received data from the Android device. A PDF help file is available on the website above. The Android device requires the app Pocket RxTx ver 9. The app will send data to the PC for CAT control of the radio. It also handles audio in/out to the PC. The PC, via jAReC, receives the CAT data and audio in/out and in turn, sends same to the radio via the interface. VERY SIMPLE!! A PDF help file is available on the website above. Pocket RxTx seems to work on android 4 and above. In my case, I use an el cheapo Telstra 4GX Android phone running android 6. I connect to my home network LAN via WiFi. It works very well. Most main TS-2000 CAT commands are available, including remote radio on and radio off. I plan to try the system via WAN. I will use one of the free DDNS services. The other alternative is to have a static ip address assigned to your home router. Telstra wanted an extra $10 per month for this service. I declined!! With a WAN DDNS, I can operate the radio from anywhere in the world via my Android phone by tethering to a WiFi point or using direct connect with a data phone app. My system uses port forwarding via the NBN router. 2 ports are used. One for CAT control data and the other for audio in/out. This is very easy to set up. It is important that your PC on your home network is issued with a static ip address. In essence, my system works very well. I have tested it on most bands (HF, VHF and UHF) and most modes. For me, the system is a winner. There are other programs that you can use to perform all the functionality, PC and radio, at a remote site. The main thing is the ability to remotely control your PC in case of a system crash. There are programs that will allow you to shut down and restart your remote PC. I have used WAKE on LAN in the past. This is a complicated set up. However it is possible. If you would like to give the system a try, first up, I suggest you download the 2 help files, mentioned above. Take some time to read through the help files. It is vital that you fully understand how it all works. Don’t use the version of Pocket RxTx available at Google Play Store (ver 8). Download the software of the latest ver 9 beta from the website. It works and Dan Toma is very open to comments from people that use the beta version. I let him know that I could not, remotely, turn off the radio. He found the bug in the app and fixed it within 48 hours of me emailing him. Great service. 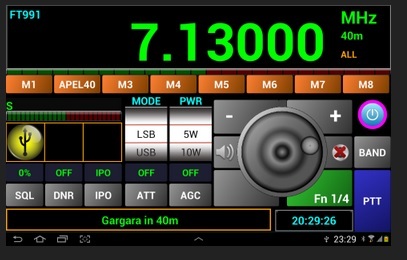 This entry was posted in Member Activity and tagged Android, Pocket RxTx, Remote Rig, Rig Control, TS-2000, VK7VH by REAST. Bookmark the permalink.